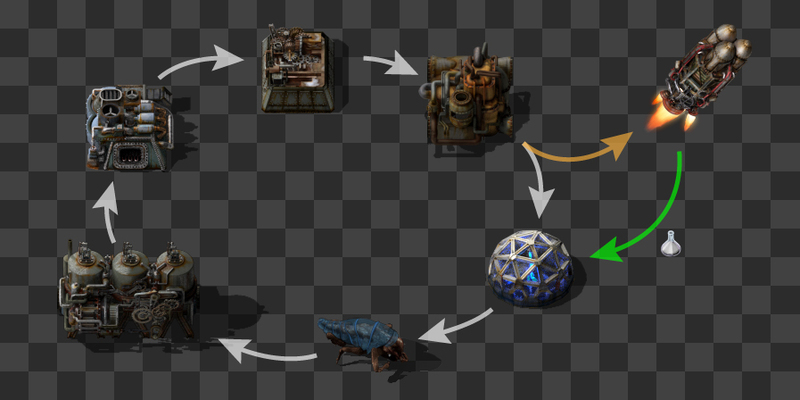 As you already know, in 0.15 we have reworked the science packs and added infinite science. More and different science packs make the game a lot more interesting. It reduces the complexity of blue science (which is great for newer players) while adding complexity later, and you now have to decide what to research first, especially with the more expensive game modes (which is interesting for advanced players), and infinite science adds something to do forever in the game. However, one of my biggest complaints about Factorio always was that the rocket has no purpose, even though it is being propagated at all the points as the final step of the game. It is said at the trailer, at the introduction of freeplay, and by being the most advanced research, everything seems like it’s the thing to desire, but when I launched it for the first time and seeing the victory screen, I was feeling like "And now what...". 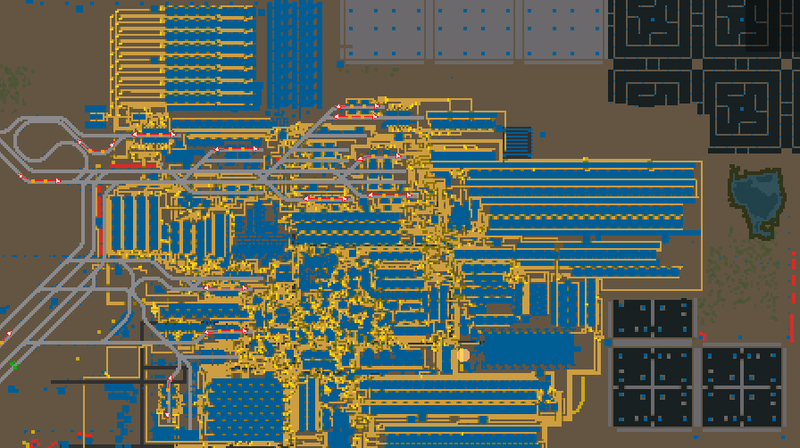 For me there is one main reason why Factorio is so awesome and why I can forget myself playing until 4 a.m., and that reason is the infinite loop of 'there is always a bottleneck', you always need to fix something, you have not enough power, or your production of a particular product is insufficient etc. When you launch the rocket, you escape from this loop because it doesn’t lead anywhere. As we can see, we have learned to take the rocket as a measurable resource sink to quantify the size of our factories, which is great, but I think it makes sense to us only because we got used to it, not because it made sense in the first place, or at least it didn’t to me. 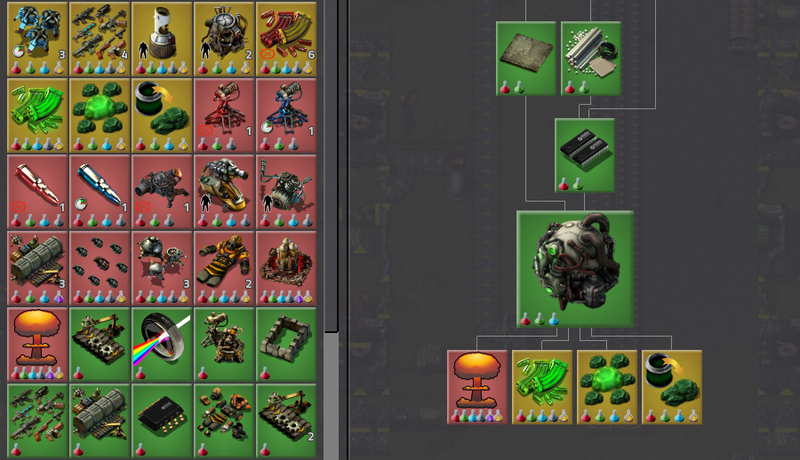 Now when 0.15 adds infinite research, I started to ask myself why would I launch the rocket at all, and I have seen many of you ask similar questions. To compare the two, the infinite science is also quantifiable as I can see the amount I produced in the production screen, it also has an interesting crafting recipe (rocket parts vs. all science packs together), and it is also an infinite resource sink. The main difference is, the infinite research is actually useful. This is where the space science comes into play. We now have a space science pack, obtained by launching a rocket. You get 1000 of these science packs per rocket, and every infinite research requires these science packs. Such a simple feature, but it closes the infinite game loop again. But of course in case you want to just launch rockets without worrying about science, you can still do that, just like previously. We have also added more infinite researches, so now apart from worker robot speed, combat robot follower count and mining productivity bonus researches, we also have all of the combative damage upgrades infinite (not shooting speed as that would get ridiculous sooner or later), however their prices increase exponentially to prevent it from getting too extreme. The rocket has to have a satellite in order to get the science packs (the rocket has to be able send back the discoveries, right?). The rocket silo now has an auto-launch checkbox so you can launch them automatically, and the launch is only going to happen when you insert satellite. So you can control the inserter with satellite to only launch rockets when you need the science packs automatically through circuit network. Of course we also added support for mods, so you can define what do you get from sending a rocket, and depending on what you put in the rocket - say, if you put a tank into the rocket, you receive 100 raw fish, because that would make perfect sense. We can build up on this concept in the future, but for now this already brings a lot of sense to the game as it is. As a bonus, here is a album of my factory where I tested the infinite science concept. There is a great amount of new graphics and high resolution translations of old ones. The biggest news is obviously the nuclear power, so let’s have a look at that. As you can see, the whole process starts with a mining drill and new uranium ore graphics (it glows at night by the way). Since mining uranium requires sulfuric acid, we needed to add a new patch for pipe connection. The acid flows between neighbouring miners, so you only need to bring pipes to the edge ones. The first step of uranium processing happens at the centrifuge, which creates U-238 and U-235 in certain percentages. Most of the time you get a U-238, but sometimes you get a U-235. When you get a U-235, you can turn it into uranium fuel cell which goes to the nuclear reactor. The nuclear reactor heats up and transfers the heat to heat exchangers, optionally via heat pipes when the setup gets bigger. The heat exchanger accepts water and outputs steam which then goes to the steam turbines which generate power. The centrifuge can do a few other processes which are useful for getting more U-235 and re-utilizing burnt out fuel cells into more U-238. Even though it’s one of the most expected things, we probably didn’t mention before that you can make uranium ammo and tank shells from U-238, and U-235 can be used to create warheads for rocket launcher missiles which erase about 50 tile area per shot of anything in the way, including you if you don’t run fast enough. The steam comes out of the heat exchangers at 500 degrees, which is the maximum a steam turbine can utilize. A steam engine in comparison can only make use of steam up to 165 degrees - which is what a normal boiler produces. So if you use a steam turbine with normal boiler, it will work, but the turbine will have a poor efficiency. And if you use steam engine with heat exchangers, it will work, but a lot of the heat will be lost for no benefit. As you already know from earlier, we have also changed the boiler to be 2x3 tiles instead of 1x1 which required new graphics. 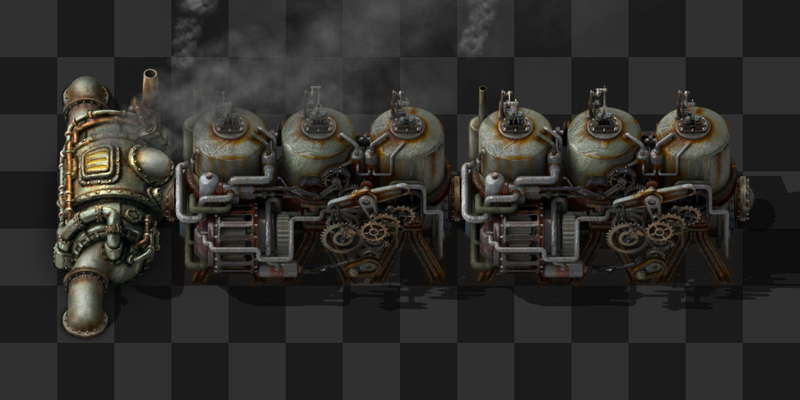 We also added high resolution steam engine to make them go together nicely. This also allows for some new designs which is very nice. The ratio of boilers to steam engines is exactly 1 boiler to 2 steam engines now. As you already see with the nuclear graphics, they all have their high resolution versions, but what else is there? 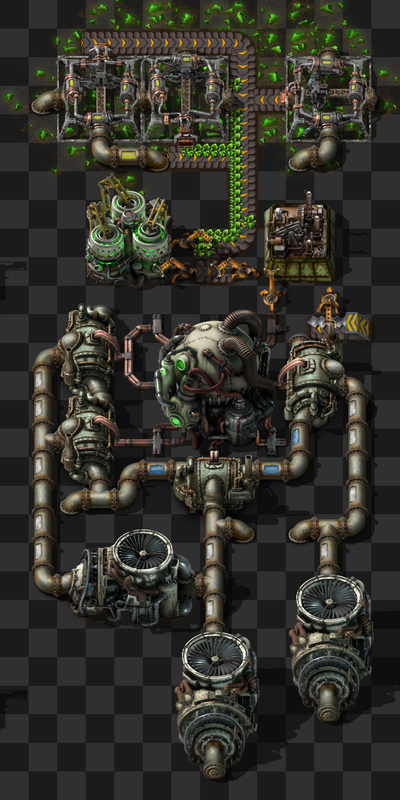 Everything in the following picture except inserters is in high resolution. The high resolution terrain integration is still in progress, so it won't make it to 0.15 right away. During 0.15 stabilization we will be adding more high resolution graphics, with the aim to do everything. Let’s see how that goes, but seeing what we already have, we are confident we can get it done sooner or later. For a long time we have been keeping some placeholder icons and we wanted to replace the skin of the GUI in 0.13 already. Here is how it looks like now. The changes aren’t massive, but it has a big impact on everything. Because of that, some of our icons needed changing so that they don’t become less visible. There are also many new icon replacements for the old awful things like mining drill, laser turret, rail signals, and more. We will likely tweak it further, but this is what we have for now. The technology tree looks like this. We have reworked the map colors to make them look nicer and give a little bit more info what is what. As you can probably see, it has been a lot of work, and we are very proud of it. The best part is that you will all be able to help us play and test 0.15 this coming Tuesday, so let us know what you think on our forums or I personally am also active on reddit.